Have you ever noticed that the less you do something, the less you want to do something? I noticed this the other day when I’d missed a workout at the gym. My brain started to talk me out of going for my next scheduled workout. Luckily my commitment to wellness prevailed and of course I felt amazing as soon as I got into the flow of my workout. It’s the same with blogging. I’ve been blogging since 2004, and helping other people with their blogging and online writing since 2005. Yet lately I haven’t been feeling as enthusiastic about my blogging. Why? I’ve been missing the essential anchor of any blogging plan: a clear business goal. I’ve been trying a few different things to launch and promote my new Content Mastery Formula program, and I’m not quite sure where to go next. This lack of clarity is leading to a lack of blogging momentum. Put them together, and I’m starting to feel some serious self-doubt. I know that I’m not the only person in this situation, so I wanted to share some of the ways I’m approaching this situation and how you might as well, so we can all learn together as we proceed. What’s most important is that we keep blogging, even through this time of uncertainty. I don’t want to stop blogging completely, or go into hiding. That’s important both for my business – my professional credibility – and also for myself. If I were to just disappear and say, “Well, when I get the rest of this sorted out I’ll jump right back into blogging,” I have a feeling it may not go as smoothly as that. Be gentle – Now is not the time to put pressure on yourself or hold yourself to a ridiculously unrealistic standard. If you’ve been blogging weekly, pare back to two or three times a month. If you’ve been blogging monthly, do try to keep that up, both for your own sense of momentum and also just so people keep you on their minds and in their hearts. That way they’re not completely surprised to hear from you after several weeks or months. But the trick is to write shorter posts and/or invite a guest expert to write or be interviewed about something they enjoy talking about, that will also be beneficial to your readers. Or experiment with other ways of producing content, like these Facebook Live videos I’ve been doing. A change in format may just be the boost your blogging needs. Stick with the basics – Go back and cover topics that have gotten a good response before. Find a new slant or simply update the information with the additional experience you’ve amassed since you wrote the original. Don’t worry that you’ve already covered this – people either haven’t seen it, or they’ve seen it and loved it and will appreciate the reminder. If you’ve explained something hundreds of times, that just means hundreds of people have asked you about it, and that hundreds more are probably wondering the same thing. By focusing on the things you know inside and out, you’ll keep up your confidence and remind yourself and your audience of your core areas of expertise. Be sincere – Don’t make false promises or pledges about how or when you’re going to “come back” or how much content you’re going to produce by a certain time. It’s up to you how much to share when you’re right in the middle of your process. Authenticity, honesty and transparency are precious (I’ve seen many business owners do this beautifully and naturally, including author and writing coach Debbie Weil who sent out an update about her personal situation right while I was preparing my notes for my FB Live presentation! ), but you don’t need to let people backstage if that doesn’t feel right for you. It also depends on what type of business you have. If you’re a business coach, it may be very appropriate for you to talk about your process, because you help people with the inner workings of their own businesses. In my business and perhaps in your wellness business, this is not what we normally talk about with our clients, so stay broad and don’t get into too much detail. You can always tell the story later, once you know how it ends. Seek clarity about your business – but don’t rush – Of course, we all get into states where we are feeling unsure about our business and where we’re going next, and of course we want to seek that clarity. But what I’m finding for myself is that I can’t rush this process. Let the clarity come in its own time, because I know it will, I trust that it will, and I trust it will for you as well. What feels most important is to keep seeking that clarity and stay open to receive – that might be an idea coming from someone you never expected, or other sources that have absolutely nothing to do with your business. It could be about seeking out specific counsel with people about your business, or it could just be sitting in quiet time to seek your own inner wisdom about what feels like the next right step for you. Go back to the blog planning drawing board – when you’re ready – The good thing about my four-step wellness blogging plan is that you can use it over and over again as often as you need to. So when you do get that clarity about what you’re going to do in your business, then you can go back and start again with a new plan that matches your blogging goals with your business goals. You want to be writing about the things that your ideal clients want to learn about, and things that support what you’re trying to build and grow in your business. In the meantime, think about having a temporary blogging plan, even week by week if that’s what you can manage. I’m not writing posts according to the plan I created at the beginning of the year, but I trust that when I’m feeling that forward momentum again and a stronger sense of direction, I’ll go back and create another plan that will take me forward. 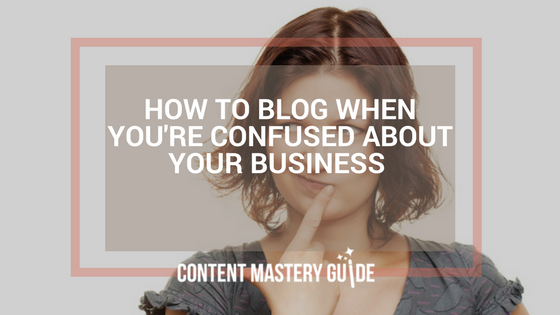 When you’re feeling confused about your business, it’s only natural for your blogging to stall. But there are ways to stay visible and keep offering value to your ideal clients, all while giving yourself the gentle space and self-care you need to find your footing again. P.S. Want to watch the Facebook Live video where I discuss this topic in a bit more detail? Here’s your link.